I made myself a goal - each day I will prepare myself a bowl of raw salad as an addition to my regular meals. There is never too much fresh stuff and the extra vitamins come in handy, especially in the Fall and Winter season. Store-bought salads are mostly very dull and pretty expensive. I wanted my salad ingredients to be rather cheap and widely available. Then I have absolutely no excuses to not make a salad every day. Are you in for the challenge? I have made it super easy for you by creating five very simple salad recipes. All these recipes serve about 3-4 people. A good raw salad contains fresh produce. I also add a little bit of lemon juice, quality cold pressed oil and a couple of handfuls of seeds. 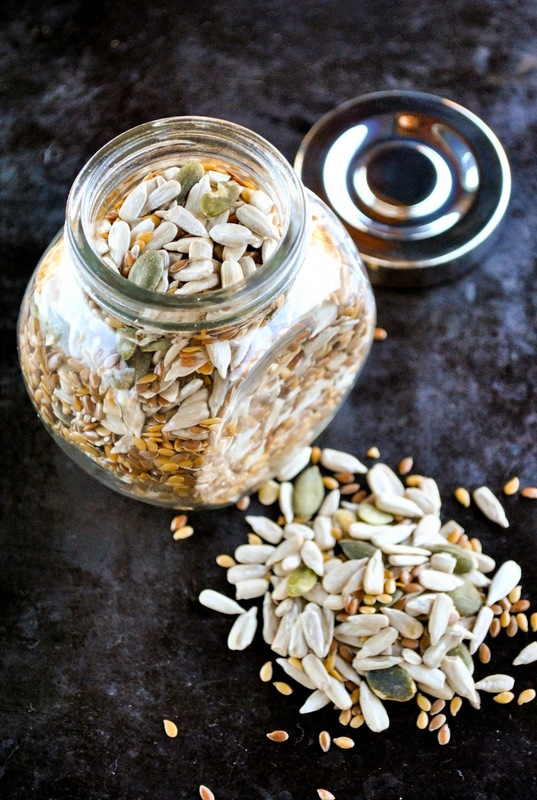 I had in mind that my seed mix should contain flax seeds (omega fatty acids, A- and E-vitamin), sunflower seeds (magnesium, selenium, iron, calcium, zinc, folic acid, E-, B- and K-vitamin), pumpkin seeds (magnesium, iron, A- and B-vitamin) and sesame seeds (calcium and omega-9). To my surprise, I found a seed mix from the store that contained exactly the same seeds I wanted. And to make salads more interesting, I sometimes use this small but handy Victorinox gadget. It wasn't very expensive, about 5 euros (compared to the bigger vegetable spiralizers). You can make vegetable noodles with it and it works really well with carrots, zucchinis and cucumbers for example. But it's not the best for round vegetables. Of course you can make delicious salads without it. A good old grater will do the job just fine. This was our nr.1 salad during the summer. My mom sent us homegrown carrots, cucumbers, tomatoes and onions and I prepared a big bowl of salad. This combination is so addicting that I could eat it every day. 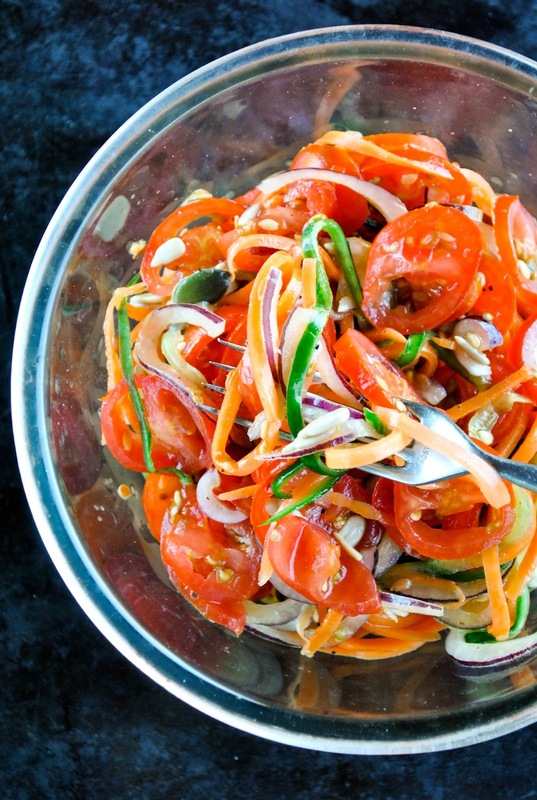 Crunchy carrots, juicy cucumber, sweet and sour tomatoes and funky onions. 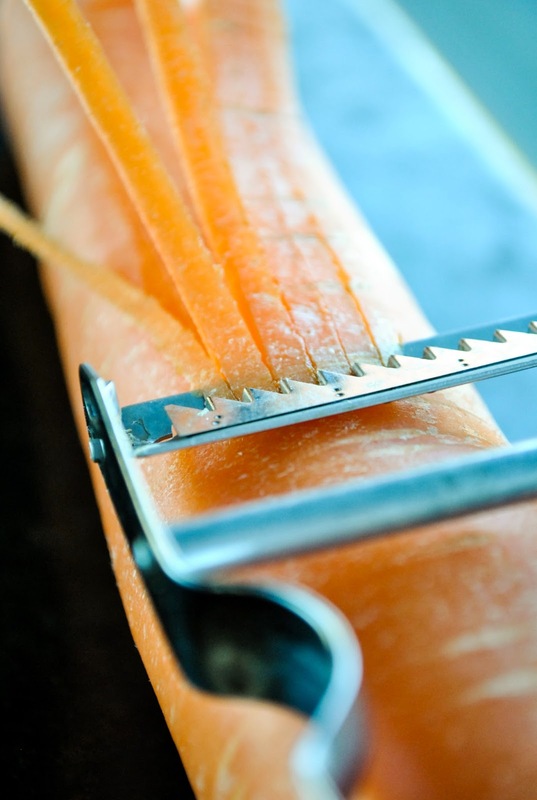 Grate or spiralize the carrots and cucumber. Slice the cherry tomatoes and onion. Mix all the ingredients together. Celery and apple always make a delicious pair. Especially root celery. 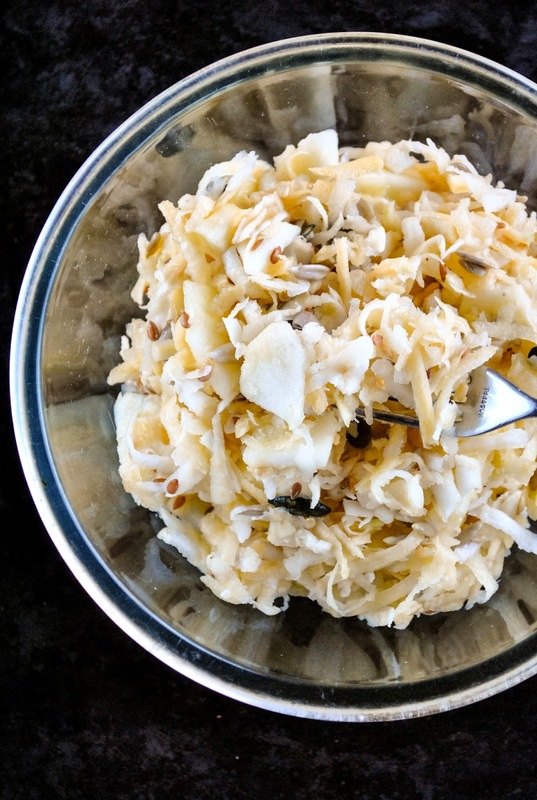 Add some grated turnip and seeds and you have a healthy and tasty salad! Peel the apple, remove the core and slice the rest of the apple. Mix the sliced apple with other ingredients. This is a super juicy salad. I love to add a little bit of curry powder to some salads. It gives a very nice warm taste. 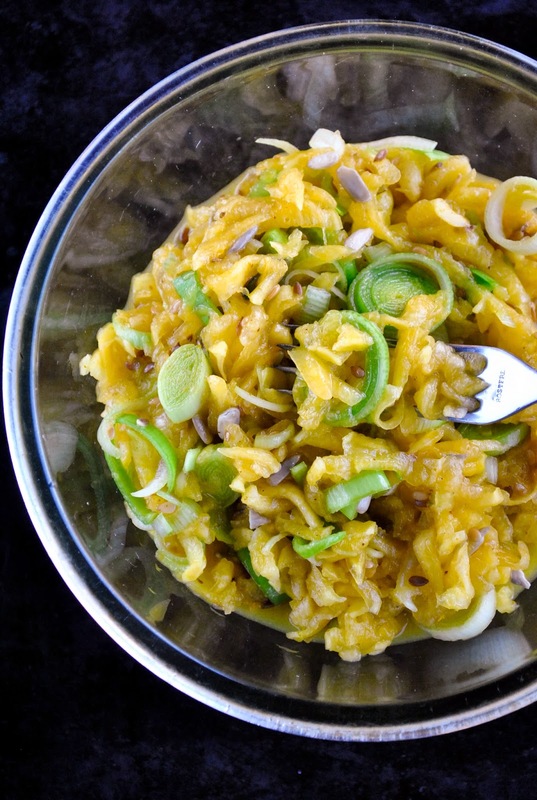 I also love to eat raw pumpkin, because it contains a lot of healthy vitamins and minerals. It has more carotene than carrots for example. And if you happen to burn yourself while cooking, place a raw pumpkin piece on the burned part of your body. It works really well, I have tried. 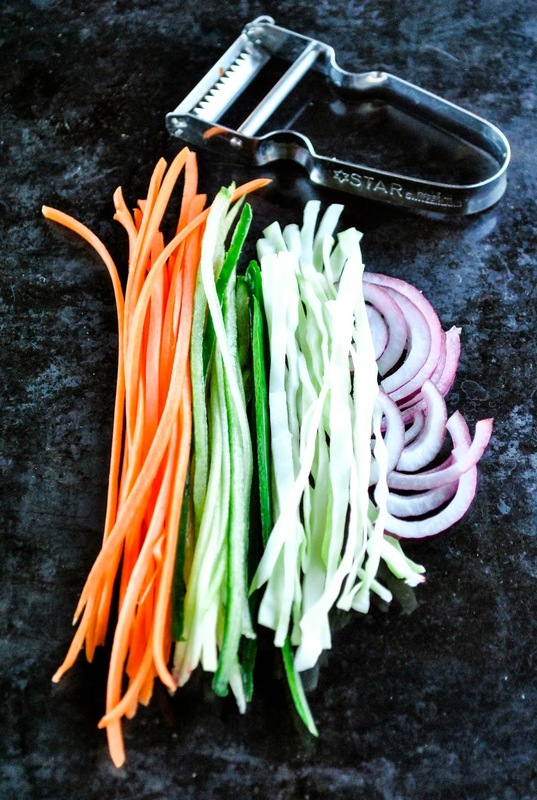 Chop the leek and mix it with other ingredients. If you just chop the regular head cabbage and add it to a salad, it is too crunchy for my taste. You have to chew a LOT to get it down to your system. I have a useful tip for that. If you mix the chopped cabbage with a little bit of salt and massage and squeeze it for a little bit, then it will be much tender and easier to eat. 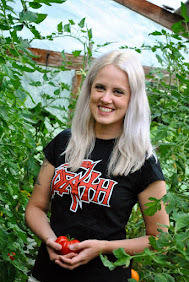 Cabbage is a really good main component for the salad - it is very cheap and widely available. And of course it is packed with good stuff - loads of vitamin C and good for the digestion. 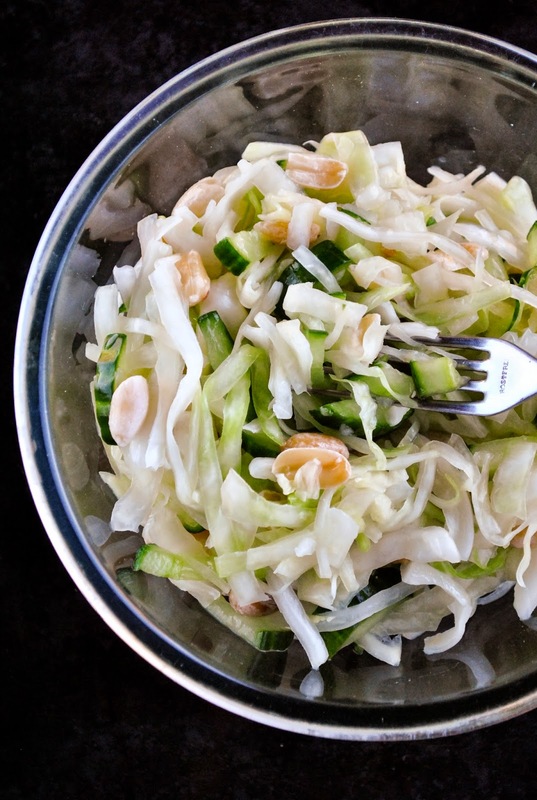 Add some cucumber, super food garlic and salted peanuts and you have a pretty awesome salad! Thinly slice the cabbage and mix it with salt. Massage and squeeze it for a little bit, so it will become much more softer. Add sliced cucumber and mix all the ingredients together. You don't always have to boil the beets to make a good salad. 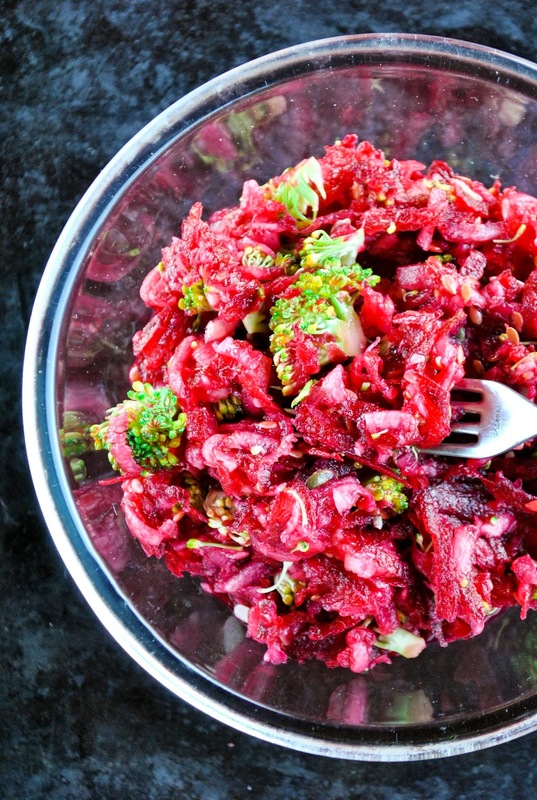 Raw beet is also really good and packed with useful nutrients along with broccoli and juicy zucchini.